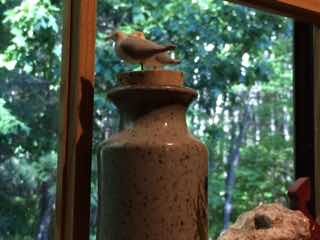 This past Friday, for Poetry Friday, I posted a beautiful poem that Keri Collins Lewis wrote for me as part of a Summer Poetry Swap that Tabatha Yeatts organizes. 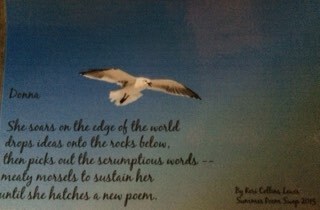 She sent me this wonderful poem placed on a picture of a seagull soaring. Both picture and poem were special to me. 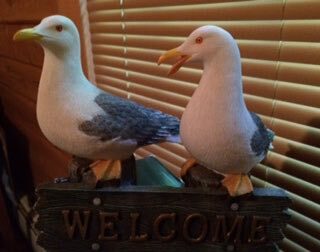 Part of the reason is that I'd fairly recently begun collecting some "things seagull" to put in our retirement home, Gull Haven, across the road from the ocean. 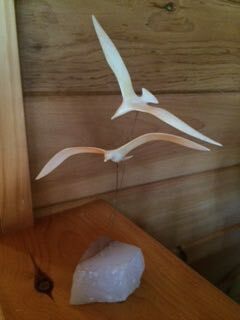 I posted my pictures of seagulls that inhabit my current home (still very close to the sea) just after the Keri's poem. One of the comments on the post that day was from Linda Baie. 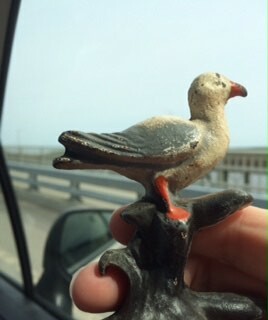 In her comment she stated, "I'm going to send a picture to you of a sea gull perched on a piling (I think) that I found in an antique shop when I was on the Chesapeake Bay with my students. I collect little iron animals, this was a lovely "find"." He is so cute! What a neat "find"! 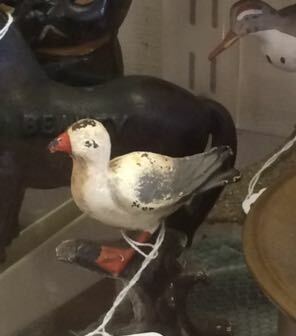 I mentioned to her that my parents had been antique dealers/shop owners for most of my life, and that after their death, my brother had taken over the antique shop. She emailed me back saying that her brother is an antique dealer, too. Wow! Now that's a neat coincidence, but we're not done yet. On Saturday morning, my husband and I usually go out for breakfast. Well, on our way there, we drove by an indoor flea market and an antique co-op where my brother has an area with some of his stuff. My husband suggested that we go in and look around after eating. I love doing that, so we headed there when we had finished our meal. We strolled through the flea market items, and then we headed over to the antiques portion of the mill building to just browse. Oh, yes, I did. You knew I had to. well, I think you are supposed to buy it and take it home. Don't you? 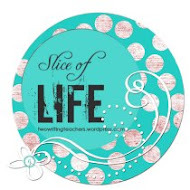 If you haven't gone by other Slicers yet... they are waiting at Two Writing Teachers... see if some nice coincidences happen to happen to you today! Let me know if they do! 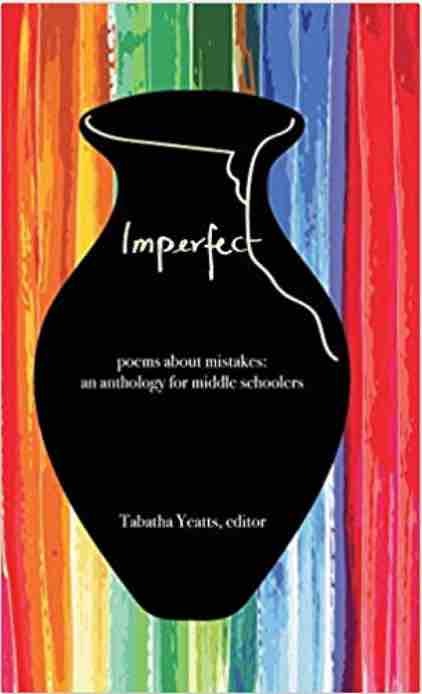 It is Poetry Friday and time to celebrate poets and poetry and all that is poetic. 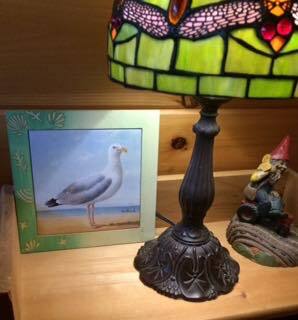 To find more poetically collected links today, please visit Carol's Corner, where Carol is our hostess today. Thank you, Carol! Next week, I will be hosting Poetry Friday RIGHT HERE at Mainely Write! That will be on July 3rd - the same weekend we have summer in Maine. Eeesh! Maybe I don't have to put that snow shovel away - winter's going to be here again before you know it! 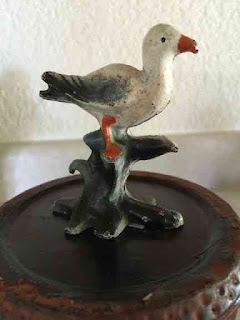 For poetry connections today I, and others, have poems posted on Michelle H. Barnes site, Today's Little Ditty, where Michelle is posting the June challenge poetry. Corey Rosen Schwartz has challenged us to write about building a treehouse, using unpredictable multisyllabic rhyming words. I submitted "Moldysocks and the Three Treehouses". Go to Today's Little Ditty to read it and more treehouse poems for June. Then Keri Collins Lewis, at Keri Recommends is sharing the poem that I sent her as our first swap of the summer. The poem I wrote and sent to her was written after reading many of her posts over the past year. It really is something I'd like to do more of - reading older posts. Often we pop into the middle of a blogger's life, and there is so much more we could learn just by reading. This fun in the sun activity is organized by Tabatha Yeatts of The Opposite of Indifference. until she hatches a new poem. Isn't that beautiful? I love it! I love the picture; I love, love the poem. And it seems to fit how I work. I like picturing the process this way. I can almost see myself "dropping ideas", like mussels, onto the rocks below. I love "scrumptious words", and "hatches a new poem"! How did she know it would be just perfect? I've already sent out my second poem for the swap. I don't know how long it will take to get to its destination. I'm staying out of this part of the process now. If you've been to Keri's site, you now know the story behind the poem I sent to her. I am hoping this second one goes more smoothly! I'm not even going to check this time. Well, not yet anyway. Have a great day... read more poems! 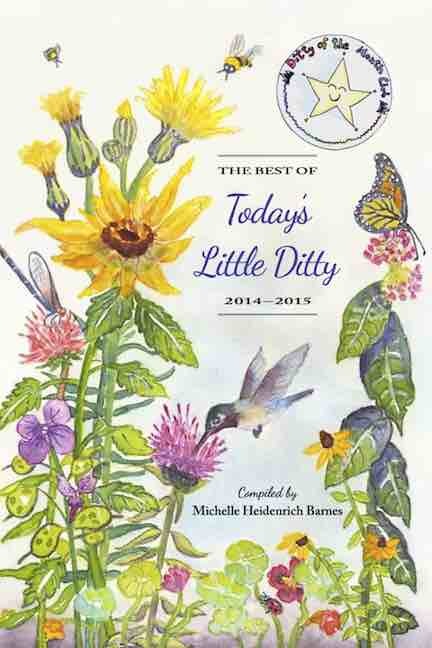 To read my "rest of it", go visit Today's Little Ditty where Michelle H. Barnes is hosting. It's part of a challenge given by Corey Rosen Schwartz to write a multisyllablic rhyme about building a treehouse. Fractured ( and fractioned) fairy tales were mentioned, so I used that format. Then in a prior post, last Thursday, limericks by Robert Schechter, so I employed that poetic format. Thanks for featuring my poem today, Michelle! My "low pressure indicator" last week, said that one of my tires was low. They looked fine, so I ignored it. Then, a few days later the front driver's side tire looked like it was low when I was out shopping. 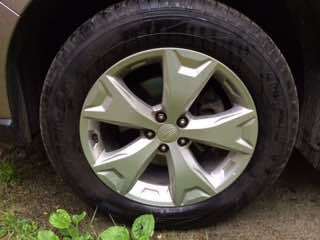 I called my husband, as I usually do for car issues, and he came out with a compressor and filled my tire more. It was low by a few pounds. All was good for a few days. Then the light came on again while I was out and about. I looked at the tire, and it did look low again. My husband was out of town now though, so no calling him for assistance. However, I was pretty close to a shop that did our oil changes and tire work, so I opted to drive the short distance to see if they had time to check my tire. They are amazing. They took me right in and got me on the road again in no time. I think I was there all of 15 minutes. And while I was there, I wrote because that is what I do when I wait and I have my iPad with me (or a receipt, or a napkin, or a plain, light colored skirt). He sighs and takes my keys. I try to stay at ease. as I rise from the chair. "Thanks, have a good day!" Now I think I hear the sounds of other poets out there milling about....go check out Poetry Friday offerings being hosted at A Year of Reading with Mary Lee. But before that, thanks, Jama, for hosting the Roundup today at Jama's Alphabet Soup. Make sure you go there and enjoy the fare! On Monday, I went to school to do my usual reading and writing with second graders. And as usual, I had a blast. I am always delighted to have students greet me in the hallways again, as I did when I taught. But these days it is a different greeting. "Are you going to read with me?" Sadly, I cannot take them all! And I hear the disappointed "Aw" when they aren't the one to come with me to a quiet corner to read or write for a few minutes in their day. Now, remember, I was a long time classroom teacher, so I know most of the yearning I'm hearing is for a walk down the hall, or a potential break in what they were doing. I'm not naive, but it is still nice. Monday was like all the other days, even though we are close to the end of the school year now. The students are still reading and writing up a storm - especially writing poetry lately. This day, I got to write with a wonderful, eager student for a little while, and because she was so enthusiastic and it was our second time working together, we got a lot out of our brief time! Me: Ok. How about doing an acrostic? Do you know what an acrostic poem is? 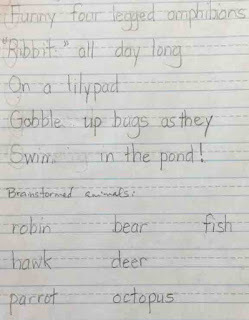 I explained what an acrostic was briefly, and then we wrote an acrostic poem together using "FROGS", with me modeling the format and her offering some words - like amphibian and lilypad, gobble and pond. Me: Okay, now it's your turn. What are your favorite animals? Abby: Birds! No, not birds. Robins! Hawks! And parrots! Parakeets! I really like parakeets! Me: How about bears or deer? Octopus or fish? Abby: Yes, I like all of them! But I really like parakeets! Abby: Ok. I like robins. 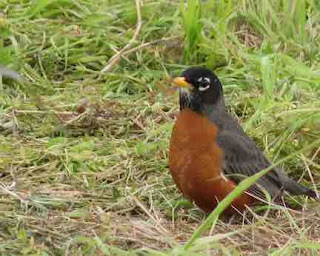 Me: What is there about a robin that could begin with the first letter, R? Abby: Red! They are red all over. Me: Are you sure? I think they are red or orange only in one part. She was pretty sure they were red all over, so I suggested that we look them up on the computer to be sure what they really looked like. 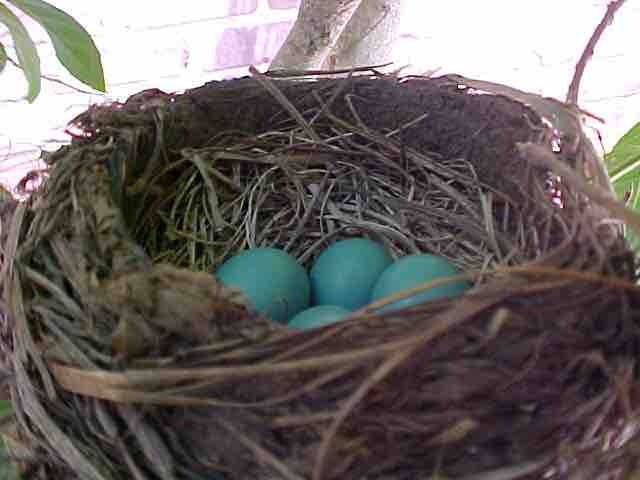 I did a search (because I don't like having a student do searches unless I have already used the search terms prior to their search) and came up with a great page that showed adult robins, robin eggs in a nest and some baby robins. I read the description of a robin to her. When I told her that we could also listen to the robin's song on the page, she was very excited. She put on a headset and listened intently, adjusting the volume. Her face lit up. "It's beautiful!" she shouted (headsets will do that), and she promptly hit "play" again. 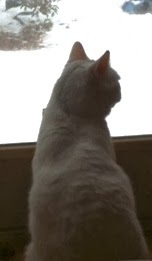 I suggested that she might be able to identify a robin now just by it's song, even if she couldn't see it. Me: Now, let's get back to your poem. Maybe that information will help you write your poem. Abby hunched over her paper and began to write. I pointed to the O in "on" she had written on the first line, and she quickly realized it could go to the next line for the O in "ROBIN". 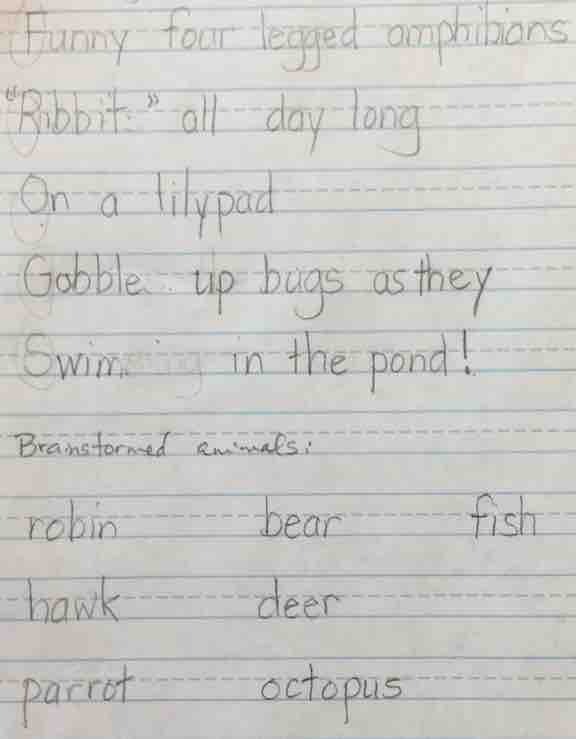 When she got to the letter B and hesitated, I just asked her to think of what we'd learned about robins. I expected "bird" perhaps, but she began writing "blue eggs" instead, and the rest continued to flow out easily. 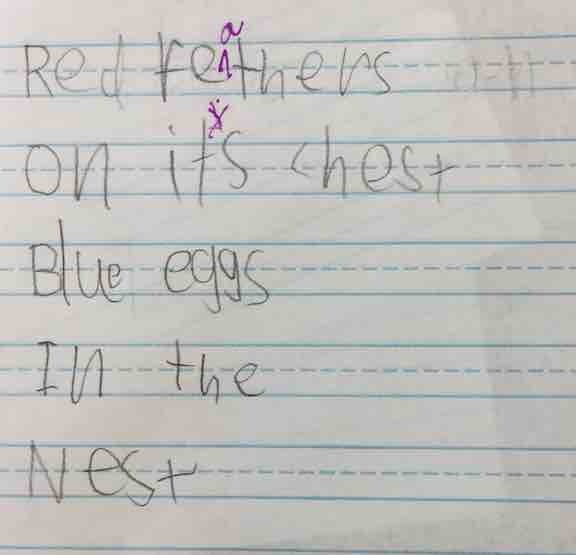 She read it to herself and edited it before she read it aloud, fixing the spelling of "feathers" on her own. We discussed "it's" versus "its" for her to determine which it should be. Then, finally, she read it to me. Me: And you made it rhyme! She read it aloud again. Isn't it great? I wish I had written it! Another poet is being sent on to third grade and beyond! Now how about that parakeet poem? Today's poem was inspired by Laura Purdy Salas' challenge to write a 15 Words or Less Poem to go with a picture of a "gone to seed" dandelion. 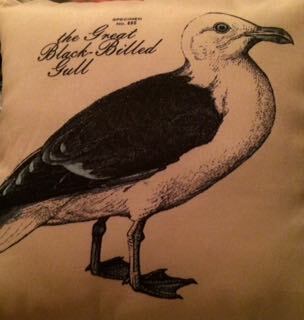 Go here to see the image and other poets' offerings. I've put my own images here, for my poem. Happy Poetry Friday! 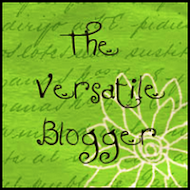 Join more poets and poetry lovers at Buffy Silverman's where she is Rounding Up all the links today on Buffy's Blog! 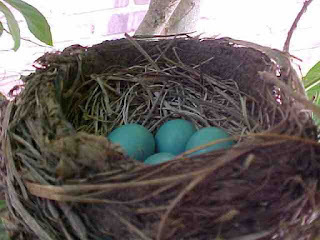 Just before mowing the lawn last week, I was able to capture a short video of the bluettes in the moving shadows. I love summer shade!